Today we’re excited to announce a brand-new member of The Odyssey ScoopCast team. Josh Taylor of the wildly popular YouTube channel Blimey Cow has agreed to join our podcast team as a co-host. Many of you know Josh and his team for their witty and thought-provoking videos dealing with a variety of issues. We’ve officially brought in Josh as a co-host to join ScoopCast creator and host Kevin McCreary. Kevin is responsible for the creation of The Odyssey ScoopCast and has hosted and produced the show since the show’s launch in April 2010. Josh’s experience and radio personality will make The Odyssey ScoopCast even better as we move forward into a new era of the show. 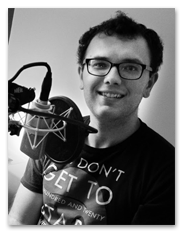 We trust you will enjoy Josh’s insights into the world’s most popular audio drama. You may have noticed we’ve been bringing Josh into the conversation as a special guest for the past few episodes. We’ve enjoyed his presence on the show as much as you have and decided to bring him to the team. Fans, we were listening to your feedback! You can hear Josh in our latest interview series with Katie Leigh, voice of Connie Kendall for Adventures in Odyssey. Listen to the interview here. Josh Taylor has loved Adventures in Odyssey for as long as he can remember. He has a passion for video and launched the popular YouTube channel Blimey Cow in 2005. In addition, he is the host of five podcasts, including The Odyssey ScoopCast. In 2010, he graduated from Trevecca University with a degree in Mass Communications. He has worked in both television and radio in various roles. While attending college, Josh had an opportunity to host his own evening radio show that was broadcast throughout Nashville, Tennessee. When he isn’t “YouTubing” and podcasting, he enjoys board gaming and biking. Josh currently resides in Nashville with his wife, Kelli. –Subscribe to The Odyssey ScoopCast and never miss an episode.